There are over 70% of adults suffering from some form of gum disease. Gums are a vital structure in your mouth that have the ability to affect your overall dental wellbeing. Often, gum disease strikes in a silent manner and when you realise there’s something wrong in your mouth, it’s usually too late. However, if you consult your periodontist right away, you will be able to keep your teeth intact and prevent serious oral health problems in the near future. Gum disease can be a devastating condition that can’t be addressed with a simple solution, especially if you’re treating it on your own. You need to make an appointment with a dental professional to prevent the progression of the disease. Periodontal disease allows the accumulated bacteria beneath the gingival tissue to leach into the bloodstream and affect other tissues all over the body. While medical science keeps on exploring the mouth-body connection, more conditions are discovered to have a relationship to poorly managed gum disease. Fortunately, through gum disease treatment you can help reduce your risk of developing the above mentioned conditions and other life-threatening health issues that are connected to gum disease. Early diagnosis and treatment are the keys to better oral health and continued body wellness. After you have been treated for gum disease, you may feel like going back to your old, poor dental habits, which may only lead to progressing your gum disease. Gum disease treatment is designed to lessen the physical effects of the condition and prevent it from developing any further. On the other hand, if you stop caring for your teeth and gums and skip your dental visits, the disease will once again wreak havoc in your mouth, affecting your oral health and general wellbeing just like before. Brush your teeth along the gum line at least twice a day, especially every after meals, in the morning and before bedtime. Use a small head toothbrush with soft bristles. Children aged 18 months to six years should use low fluoride toothpaste. People six years and older should use standard fluoride toothpaste. In addition, healthy diet plays a significant role in maintaining healthy gums. Consuming sugary foods and fizzy drinks contribute to a thick layer of plaque. It’s best to avoid or lessen the consumption of these types of foods especially between meals to help keep plaque levels under control. Instead of eating unhealthy meals and junkfoods, follow the Australian Dietary Guidelines and enjoy a variety of nutritious foods from the five food groups daily. This includes fresh fruits, vegetables, grain foods, lean meats and dairy products. Don’t forget to drink plenty of water throughout the day. Don’t neglect the health of your mouth, especially your gums. 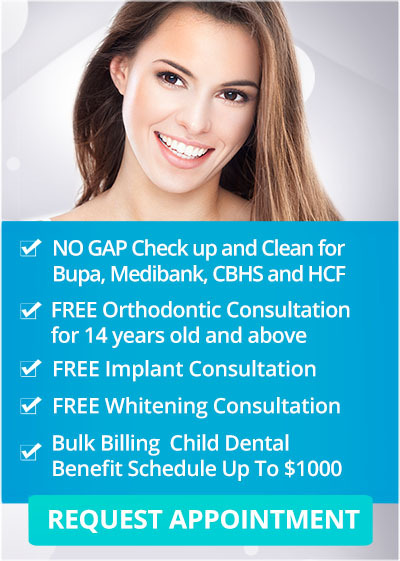 If you or your loved ones experience signs of gum disease, schedule an appointment with your dental team in Melbourne here at Q1 Dental as soon as possible. If your Melbourne dentist discovers gum disease early enough, we can diminish or reverse its potentially harmful effects. Through our comprehensive preventive dentistry and gum disease treatment program, we can help improve your gum health and overall dental wellness for a healthier you, today and in the future.